The legal department at Wirral Council (specifically Law, HR and Asset Management, Legal and Member Services section) have authorised a document to be released to me which I requested a while ago but received yesterday. You can see it below. Care to guess at what’s in the black boxes? Of course to be fair to Wirral Council the document might just be an error. 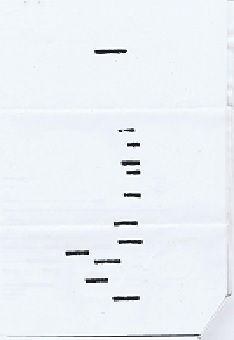 It could be the photocopying settings were just set wrong or the ink from blacking out on one page managed to go on another when they were folded together. Cllr Green (Conservative leader on Wirral Council) stated on 23rd May 2011 "he believed that under Labour there had been a lack of openness and secrecy in which the public had been excluded from decision making.". However I did read a communication written by Cllr Steve Foulkes (Labour’s leader & Leader of Wirral Council) who sent out a side of A4 co-delivered with something from Wirral Council (I think it was the annual voter registration form). It left me highly amused. In it he’s trying to consult the public in the budget setting process for the 2012/2013 budget. As some of the savings for 2012/2013 were identified for him by the previous Conservative/Lib Dem administration I’m wondering exactly why Labour councillors are trying to outsource the budget to the public. Are they trying to be popular or is it genuine consultation and engagement with the public in an effort to influence their decisions? Or is it because with so few Labour councillors, if the Conservative and Lib Dem councillors disagree with the Labour Budget it won’t get passed in March 2012?